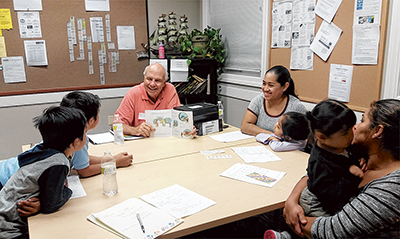 Volunteer tutor Chuck Simonds, center, reads to (from left) Adriel, Josefino, Janeth, Abigail, Mia and Maria Hernandez, as part of a family literacy class on Hilton Head Island presented by The Literacy Center. A new festival in Bluffton will benefit avid readers and those learning to love books. The Bluffton Book Festival will be held Nov. 18-19, and will feature author talks and book signings, Gullah food, drinks, live music, read-alouds for children, raffles and more. More than 30 authors have said they will attend. All this fun benefits The Literacy Center, a 43-year-old local nonprofit that helps adults gain reading, writing, math and speaking skills. 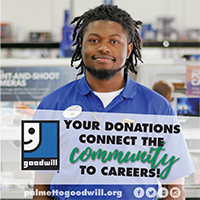 About 11 percent of adults in Beaufort County struggle with low literacy, which impacts health, job prospects, parenting and other parts of people's lives. "We wanted to benefit a local charity, and The Literacy Center was a perfect fit," said festival director Stephanie Bente, who writes books for children. Bente and festival director Rockelle Henderson asked local and regional authors to submit books for consideration, and then selected authors they felt "people who live around here would like," Bente said. The Literacy Center is funded by grants and donations. It started on St. Helena in the early '70s, when Roman Catholic nuns and other residents began working with children under the name Beaufort County Literacy Association. Since then, the center's programs have evolved to serve the community's changing needs. Today, more than 600 students per year attend basic literacy and English as a Second Language classes at seven sites in southern Beaufort County. The Literacy Center's newest initiative is family literacy, which helps children and their parents bond over books. Tutor Chuck Simonds, a semi-retired businessman, volunteers for The Literacy Center because he loves to read and wants to help others. He tutors Spanish-speaking families two evenings a week at The Deep Well Project's offices on Hilton Head Island. "It's very important for the mothers to get better at English, so they can help their children. Reading and understanding English are the keys to everything," he said. First-grader Adriel Hernandez and his brother Josefino, a second grader, take home a new bilingual picture book from Simonds's class each week. They're building a home library and have been coming to these family literacy sessions for almost a year. The classes benefit the boys' mother, Maria Hernandez, as well. "We read these books and talk about them, and I've learned new words in English," Hernandez said. "I left school in the third grade, but now I'm learning alongside with my children." Literacy Center executive director Pam Wall is grateful for the support of the Bluffton Book Festival. She has been working hard to help publicize the event, and wants people to know how low literacy affects "all of us and our community." The costs of not knowing how to read and write are high: $225 billion a year nationally in lost wages, unemployment, government assistance and welfare. Low literacy also has been linked to rising health care costs and higher crime rates. But numbers can't tell the whole story. As they read "Curious George at the Aquarium" together, the Hernandez family and their tutor are beating the statistics. The joy of reading and the thrill of success are right there in the room. For more information about the organization, visit www.TheLiteracy Center.org. For a complete schedule of Bluffton Book Festival events, visit www.blufftonbookfestival.com. Carol Weir of Bluffton is a career journalist and teacher.